Staff and students reflect the centenary of the end of World War 1. 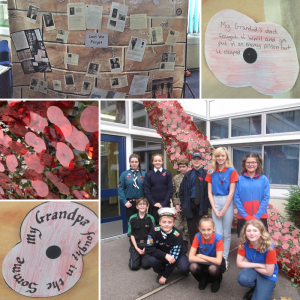 Cranbourne students and staff got together, talked to family and friends, carried out research and created a memorial to those our community is linked to who were in any branch of the armed services during any conflict. As the facts emerged the life stories of these ordinary yet amazing people began to come together. We talked about the number of relatives who had been boys and joined up under age to fight in World War 1 and acts of selfless bravery like the relative of one member of staff who had died trying to save others on the battlefield. To celebrate the end of World War I, Cranbourne School has decided to do a poppy display outside. Students created acetate poppies in their tutor groups to go on the feature outside of reception just like the display at the Tower of London and the Imperial War Museum. The design we made was secured by camouflage netting that holds up the poppies. This display has been created to show our respect to all the soldiers who fought for the lives we have today. Alongside this, many students are wearing poppies today for the anniversary of World War I in 1914-1918.